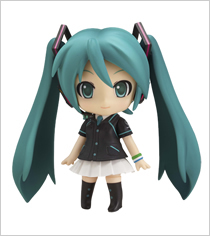 The pic above popped up on Happy Kuji website, revealing slightly further information about Nendoroid Hatsune Miku: Family Mart version (usually called as Famima Miku). First info is regarding her release schedule: August 2012, and the second one is her raffle price: 800 Yen. One of her accessories is also revealed here: her hand holding a bag of nuggets (or cakes, or some other kind of food). 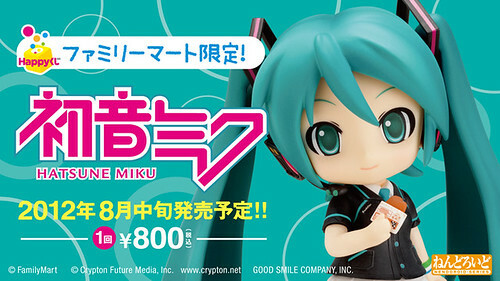 This entry was posted in News and tagged family mart, famima, hatsune miku, lottery, nendoroid. I wouldn’t mind Miku if they didn’t over do her so much and if they would change something more than just her outfit and accessories.Give her a different hair style or a different body design like with what they did with the Miku HMO one.